An online trade journal covering the North America hemp industry: agriculture, processing, marketing, research, business and regulatory news, and updates. Strong focus on hemp farming and developments in Canada. Since the last issue of The Hemp News Update came out, I flew to California and joined up with my family, who are all on a driving vacation of the United States. If you have never taken a cross-country road trip, and you ever get the opportunity to do so, please take it, especially if you live in a city. It really is amazing to realize how huge this country is and — after a drive through Northern California, Oregon, Washington, Idaho and Montana — how much we are still an agricultural and industrial country. Thankfully, hemp news continues to come out, vacation or not. The New York Times Blogs covered the Reason Foundation's new policy study entitled "Illegally Green: Environmental Costs of Hemp Prohibition." I have read the summary, and author Skaidra Smith-Heisters seems to have put together a very realistic and balanced look at hemp. 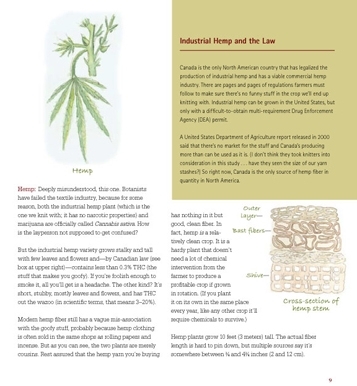 Anyone who works on industrial hemp legislation or wants to reinforce and expand their knowledge of hemp would do well to read this policy paper. If you haven't seen it yet, do also check out Robbie Anderman and Errol Francis' YouTube video "Hemp Education 101." I am reminded of it because of this in-depth background story by the same name in Barry's Bay This Week by Kate Weldon. Education on all levels, from producers to consumers and legislators to voters, continues to be the key to all of this, but it is surprisingly time-consuming and expensive. Ignorance and misunderstanding are more expensive still, so it really is worth the investment for all of our futures. No Sheep for You: Knit Happy with Cotton, Silk, Linen, Hemp, Bamboo & Other Delights is book that will grab your eye with its cover and is a wonderful read that does not disappoint. Hemp: Deeply misunderstood, this one. Botanists have failed the textile industry, because for some reason, both the industrial hemp plant (which is the one we knit with; it has no narcotic properties) and marijuana are officially called Cannabis sativa. How is the layperson not supposed to get confused? On page 81 there is a pattern and instructions for knitting Manly Maze, a hemp sweater by designer Celeste Culpepper. It goes nicely with her Maze beanie, please click here for the free pattern! Even though it's an election year, progress continues to be made on hemp bills in a few states. As we reported in the last issue, things are going well for the hemp farming bill in Vermont. The latest information is that the bill is likely to be taken up in the Senate in mid-March. Things could be going better for the hemp study bill in Wisconsin, however. The bill has been recommended in committee, but is having a hard time getting a floor vote. Wisconsin residents, see our recent Action Alert for more information and to take action. On a more positive note, the hemp farming bill in Minnesota, which was carried over from last year, was amended and passed out of the House Agriculture Committee and referred to the Public Safety Committee, where it eked out a close vote, but there is some opposition. Over the weekend, I took the time to re-read the North Dakota farmers' appeal that was filed late last month. It seems long at 48 pages, but it's actually a pretty easy read. I found on page 23 that the District Court relied on material outside the pleadings, the USDA's Industrial Hemp in the United States: Status and Market Potential (2000), and quoted from the report in its decision. If you have the time, please download and read the appeal yourself. As many of you are aware, HIA Board Member Alex White Plume and his family lost their house in Manderson, South Dakota to a devastating electrical fire late in December. I have been very impressed with the generosity of people in the hemp industry! Since the fire, thousands of dollars have been donated to the White Plume family through The Hemp Report, Vote Hemp and the HIA — and Nutiva donated a late-model Apple PowerBook laptop. The photograph that illustrates the Indian Country Today story at the end of this newsletter was taken by Matt Rankin and was originally in the post at The Hemp Report entitled White Plumes Rebuild, where you can make donations. Please donate, and encourage others to help as well. Many thanks to those who have already done so! Please support our current sponsors. Search the Hemp Report web site and back issues.